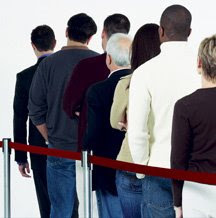 Most of us don't like standing in line at a bank. Working our way through the maze of ropes is something we'd rather avoid. We suspect that bank robbers don't like it, either. This week employees at a bank in Ohio noticed that a man was standing in the queue line with a ski mask pulled down over his face. He patiently waited in line with all the other customers. When he finally got up to a teller window, the teller politely asked that he take off his mask. It was then that he pulled out a gun and demanded the cash from her drawer. The teller complied and gave him an undisclosed amount of money. As you might suspect, the unusual sight of a man waiting in line, wearing a ski-mask tipped off bank security that something was awry. Police were on the scene within moments and arrested 24-year-old Feliks Goldshtein of Highland Heights, Ohio after a brief car chase. Police Captain Rick Myers stated the obvious when he observed that most bank robbers don't wait in line wearing their masks. As it turns out, Feliks gun was just a toy. The charges against him for aggravated robbery, however, are real.